Personalized wedding sunglasses are a wonderful memento for weddings—one that will remind the happy couple, as well as the wedding party & guests—of the very special occassion. Here at Print Sunglasses, we pride ourselves on being the premier, one-stop shop for custom-printed wedding sunglasses. Here is where you’ll find our most popular styles of sunglasses for weddings—a lovely array of premium quality sunglasses that are especially popular with wedding parties. With our talented in-house designers eager to assist you in bringing your wedding theme or ideas to fruition on your very personalized, perfect wedding sunglasses. 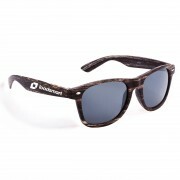 Wensure quality printing on a multitude of classic as well as contemporary sunglasses designed especially for weddings. Being extremely well versed in give-away wedding favor sunglasses, we can imprint custom logos, messages or client-desired/designed graphics on either one or both temples of the chosen sunglass. We offer free artwork creation for our clients and printing in a wide range of colors that won’t wash—or scratch—off of the sunglasses. (NOT STICKERS!) With all printing being done right here in the U.S.A. we can provide rapid turn-around times too! 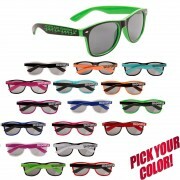 The most popular personalized wedding collection includes Caribbean Classics, Baja, Glow-in-Dark, and Bamboo Wayfarers. However, we can custom print on almost any type of sunglasses, so if you don’t see something you like here, be sure to contact us! 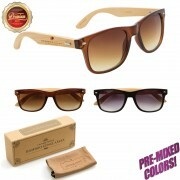 We offer only quality-made sunglasses for weddings with a fabulous range of customizations available. 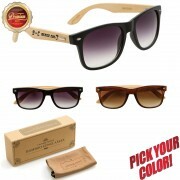 Personalized Wood Sunglasses. Iconic all-time favorite frames! 100% UV Protective Lenses Size: One size fits most. Your price includes a one-color imprint on one temple. TOLL FREE number (1.844.242.1255) or email info@printsunglasses.com with your requirment. "We received the classic sunglasses and they are totally awesome! We are very impressed with your product, and you can't beat the pricing! Personalized sunglasses- the best wedding favors ever!